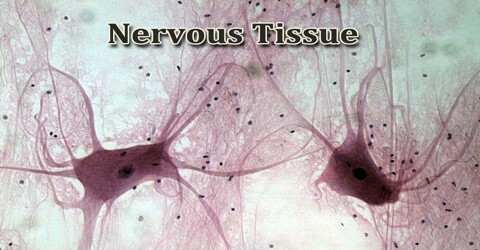 Nervous tissue is a highly differentiated tissue composed of nerve cells, nerve fibers, dendrites, and neuroglia. It is composed of neurons, or nerve cells, which receive and transmit impulses, and neuroglia, also known as glial cells or more commonly as just glia (from the Greek, meaning glue), which assist the propagation of the nerve impulse as well as providing nutrients to the neuron. There are several main components of our nervous system, and they are composed of nervous tissue. The word tissue tends to elicit the thought of wiping runny noses. But in terms of our body, tissue is defined as a group of cells with the same general functions forming organs and other body parts. Of the five main types of body tissue, nervous tissue is responsible for receiving, sending, and processing sensory input. In this lesson, learn about the components of nervous tissue and gain a better understanding of how it works for our body. 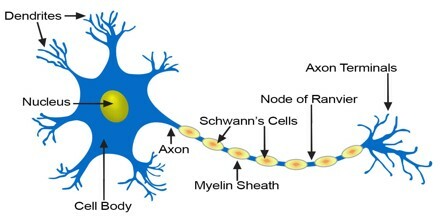 It is made up of different types of nerve cells, all of which have an axon, the long stem-like part of the cell that sends action potential signals to the next cell. Bundles of axons make up the nerves. 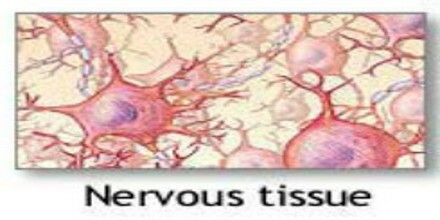 Nervous tissue makes up three major parts of our nervous system: nerves, the spinal cord and the brain. Our nervous system consists of two main parts: the peripheral and central nervous systems. The peripheral nervous system consists of the nerves that extend to all reaches of the body- the periphery. The central nervous system is made up of the spinal cord and brain and is the central processing center for all stimuli. The spinal cord and brain are also made up of nerves. These nerves are housed in a soft material known as matter. Neurons are cells with specialized features that allow them to receive and facilitate nerve impulses, or action potentials, across their membrane to the next neuron. They possess a large cell body (soma), with cell projections called dendrites and an axon. Dendrites are thin, branching projections that receive electrochemical signaling (neurotransmitters) to create a change in voltage in the cell. The function of nervous tissue is to form the communication network of the nervous system by conducting electric signals across tissue. In the CNS, grey matter, which contains the synapses, is important for information processing. White matter, containing myelinated axons, connects and facilitates nerve impulse between grey matter areas in the CNS. In the PNS, the ganglion tissue, containing the cell bodies and dendrites, contain relay points for nerve tissue impulses. The nerve tissue, containing myelinated axons bundles, carries action potential/nerve impulses. The extensions or appendages coming from the receiving end of the cell body are called dendrites. Dendrites have many different branches, like dozens of little fingers grasping for the incoming information.